The first step in protecting your electronics and hardware is to reduce static charges built up by yourself and your employees. The most common means by which employees generate static electricity is through their feet as they walk back and forth. While clothing can contribute to this, the resistance of carpeting and shoes is the most common way that excess static electricity can be created. Improper flooring can lead to tens of thousands of dollars in damaged property, should a static charge go off within one of your electronic devices. To avoid this kind of serious issue you need to invest in proper flooring. With matting you remove the static generator, giving employees the ability to freely move around the workspace with potentially damaging your electrical equipment and/or merchandise. What Matting is Made From? Matting is usually made from either a vinyl base or rubber base. Vinyl is most common as it closely resembles other forms of flooring you may use around the facility or even at home. Vinyl costs less making it possible for you to outfit the entire facility or at least the area where your electronics are kept, with the material. However, vinyl is not always the best option. It really comes down to the kind of equipment you work with. Rubber matting is more expensive than vinyl. It typically is a thicker material as well. However, the rubber design helps not only reduce the generation of static energy but prevent heat distribution. When working with chemicals and other sensitive materials, temperature and heat control is vital. 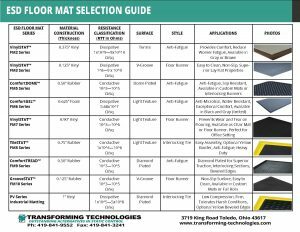 So, when selecting the right kind of matting for your facility, take in mind the kind of equipment you work with on a daily basis. Your matting comes in an assortment of thickness levels as well. A thicker material provides greater protection from static production. It also helps with temperature control. 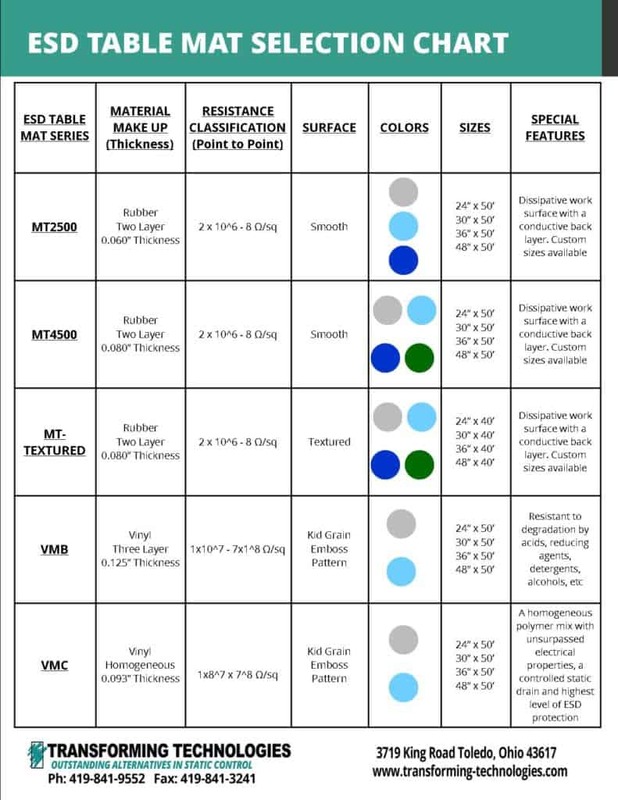 Generally, single layer ESD (electrostatic discharge) matting will suffice for basic electronics. 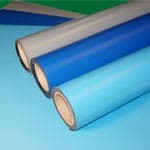 However, for more sensitive material, you can go with a two or three layer material. Matting doesn’t just come in different thicknesses and materials but shapes as well. Perhaps you have different computer stations spread throughout the building and you don’t want to outfit the entire facility with all vinyl or rubber flooring. Not a problem there, as you are able to take advantage of individual space units. There are flooring squares you can purchase that fit under a desk or small workstation. 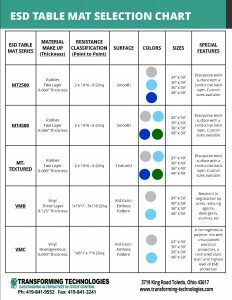 While this doesn’t protect against the development of static charges outside of that area, it is helpful for when a technician or other professional must work on the electronics. Grounding units can be placed within the matting in order to divert any possible charge away from the electronics. When you want to protect an entire room, installing full room matting isn’t an issue either. It is installed in a similar manner as other forms of flooring. The vinyl material is used in many other kinds of flooring, including bathrooms and kitchens, so this installation method does not differ much. Installation is easy and cost-effective while protecting an entire room from static electricity development. In some cases, flooring with non-slip matting is the best option. This may be the case in your server room if you do not have appropriate flooring installed presently. Removing all of the server units can result in extensive downtime, causing all sorts of other problems along the way. Instead, the non-slip addition gives a clear walking path between server units or anywhere else you might need it installed. Whatever your situation or the kind of needs you need, there is an option available for you. In the event that having permanent matting installed is simply not an option for one reason or another portable matting units are available. These units come with personal grounding devices so technicians can work in a static-free environment while also grounding themselves to the flooring. This creates the safest possible unit on the go. Having these kinds of units available even when proper flooring is installed can prove beneficial, as from time to time you may have technicians who need to leave the facility and work elsewhere. Ridding your facility of potential static energy is important. It protects your valuable electronic investments while reducing the offset chance of losing data from a fried hard drive or network. Installing proper flooring into your facility is a major step in ridding static electricity. There are several different flooring options available to you, ranging from thickness to the material it is made out of. You may also decide to go with a portable unit, when a full installation is not an option. 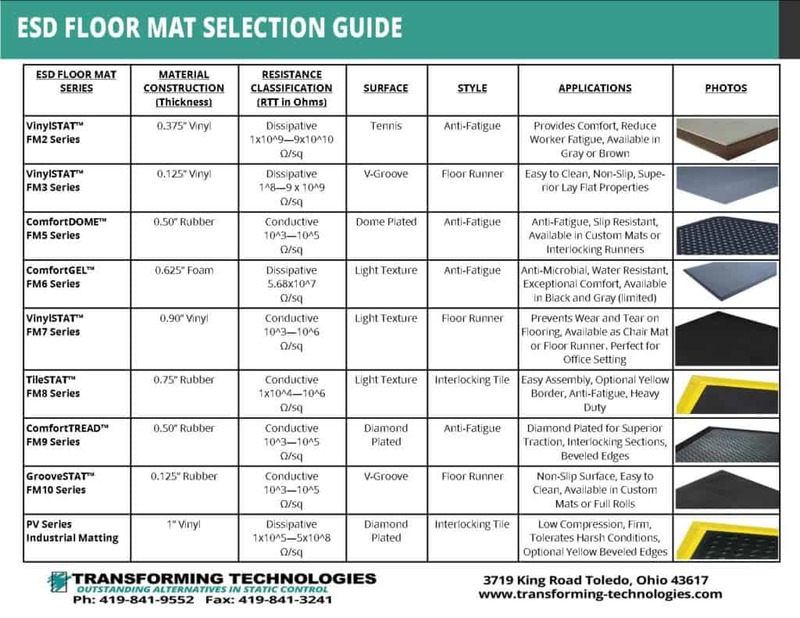 By implementing these new flooring options, you will a long way in saving your company thousands of dollars (if not more) in possible repairs.